Our country is rich in creativity and each region had its own art form. We see the example of phulkari in Punjab, warli in Gujarat, chikan embroidery in Lucknow, weaving in the North-east, kantha in Bengal, miniature paintings in the state of Rajasthan, kethari, sujani and of course mithila paintings in the Mithila region of Bihar. Madhubani painting also known as Mithila painting is an art form originated from Bihar. 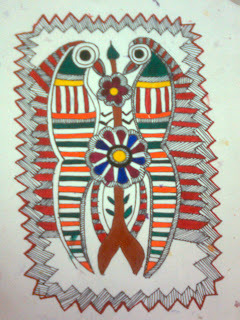 The women decorates their homes with this art form on walls, floors, canvas. They normally use natural and vegetable colours. Madhubani paintings add a dash of vibrancy in the room and enhance its appeal when used as home décor item. I want to learn / try all the art forms of our country. This painting is created on handmade paper (one of the things to learn is to make handmade paper) and water colours. Enjoying the artwork ... what amazing and detail line work. It reminds me of tribal totem.